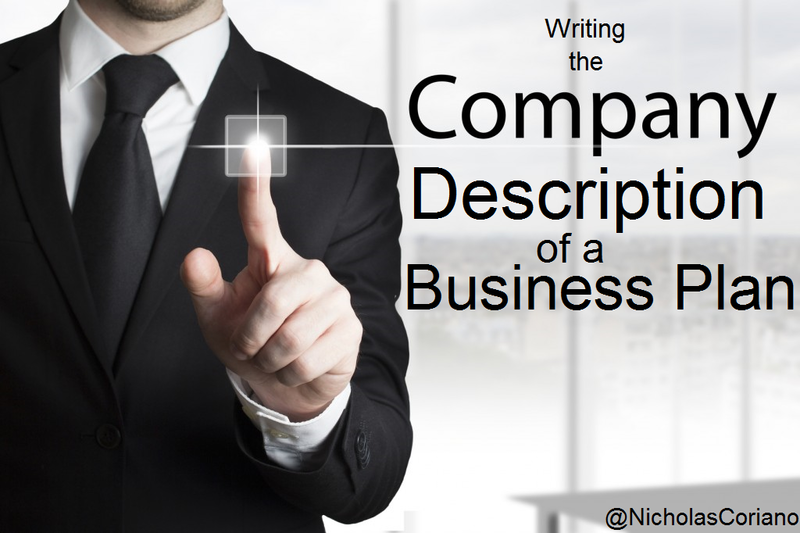 Writing "The Company Description" section of the business plan correctly is important to explaining readers your business. The company description section of a business plan, simply put, describes the company's business. Full Legal Name of the Business: This is exactly what it sounds like. Simply put the full legal business name. If prospective readers, investors or stakeholders want to do more research, the full legal name of the business is where they will start. Business Structure: This includes whether the business is a sole proprietorship, and limited liability company (LLC), and S-Corp or C Corp (Inc./Corporation), a non profit, a limited partnership (LP), etc. Under this subheading you describe the type of business structure and explain why it is advantageous to the business. Names of the Owners: This subheading includes the names of the owners and possibly investors; if pertinent to the business plan. Percentages of Ownership for each owner: The amount if equity of position each owner has in the company is described in this section. Location: The address (if applicable) or the city/state where the business is located. If the business is online, state where online the business operates, advertises or is doing business. If you are a mobile business, like a food truck, explain in this section of the business plan what locations you plan on being and when. Interior & Exterior Layout: If you have a physical location of the business, explain in this section how the interior and exterior of the business will be laid out. Products and/or Services: The most important section of the Company Description portion of the business plan is the products and services section. This explains what products or services you will be offering. This should go into detail about the features of the products or services and the pricing. This can also include a sampling of your target customers or clients. Hours of Operation: When will your business be active? When will your customers be able to purchase from you? Competitive Advantage: This is why your business is better than others. What makes your business different? Why are people going to your restaurant instead of another? Why will people use you as a service provider instead of another business professional? Mission Statement: This is defined as "a formal summary of the aims and values of a company, organization, or individual". In short, it is a sentence or two that explains what purpose the business has on a macro level. Tip: Look at other mission statements from other well-known companies to give you ideas on how to craft your own mission statement. Business Model: This is the most important element of the Company Description. A "Business Model" has been described as "a design for the successful operation of a business, identifying revenue sources, customer base, products, and details of financing. "...But I think that's too complicated! I define a Business Model as "a repeatable set of action steps that leads to a profit." It is the process, a series of steps, that when repeated....make a sale/profit. Writing the Company Description section is probably the most time consuming part of the business plan but the most essential part for an investor or reader of the business plan. This really gives a great synopsis on how the business will run and what exactly are the products and services of the business.